American family, the first known member of which was Solomon Menken. American merchant; born in Cincinnati 1838; youngest son of Solomon Menken. With his brother Nathan Davis he entered the Union army, and was captain of Company B, 27th Ohio Infantry. He is (1904) a member of the Military Order of the Loyal Legion. 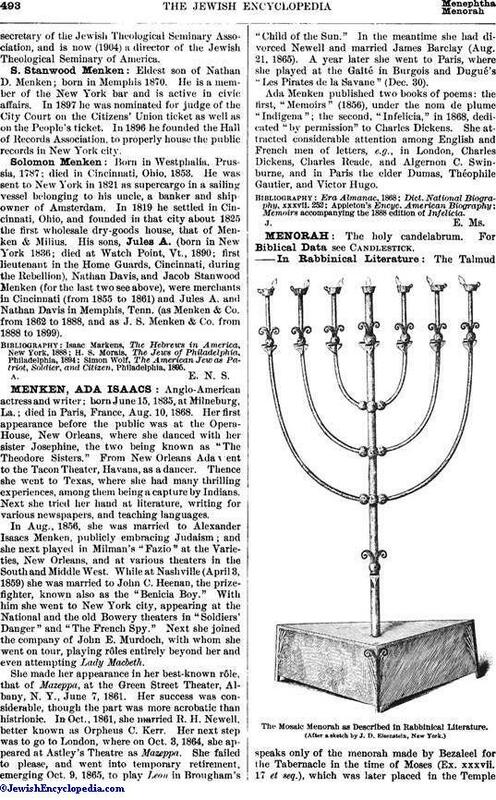 American merchant; born 1837 at Cincinnati; died 1878 at Memphis, Tenn.; second son of Solomon Menken. He entered the Union army at the outbreak of the rebellion in 1861, and was captain of Company A, 1st Ohio Cavalry. He was commander of General Pope's body-guard, and took part in thirty-seven battles and skirmishes in West Virginia, being mentioned for his "distinguished and soldier-like bearing" as a member of the supporting force in Colonel Brodhead's report (March 27, 1862) of the battle of Kernstown, Va. ("War of the Rebellion, Official Records," first series, xii. 156, Washington, 1902). During the epidemic of yellow fever in Memphis in 1878 Menken assisted a number of his coreligionists to leave the city by supplying them with the necessary funds. He himself remained, and, while cooperating with the Howard Association of which he was a member, succumbed to the disease. Menken was also a member of the Military Order of the Loyal Legion. Eldest son of Jules A. Menken; born in Philadelphia 1865; educated at Columbia University (M.A., Ph.D., LL.B.). He is a member of the New York bar, and president of the Young Men's Hebrew Association of New York. For a number of years he was a trustee andsecretary of the Jewish Theological Seminary Association, and is now (1904) a director of the Jewish Theological Seminary of America. 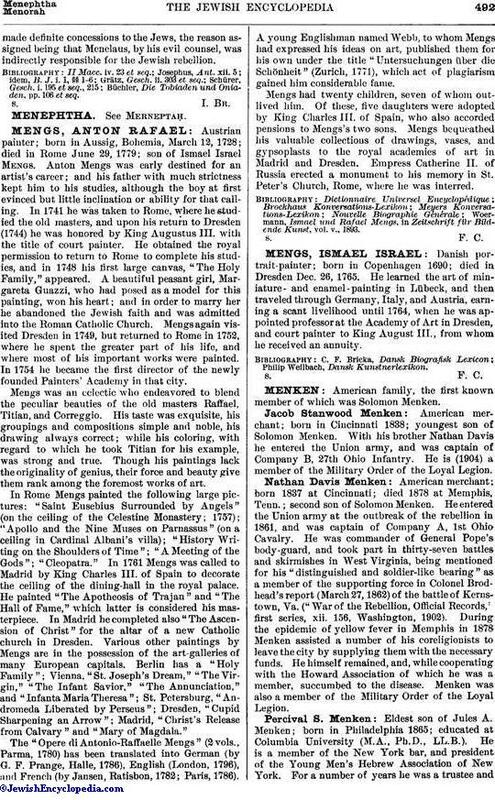 Eldest son of Nathan D. Menken; born in Memphis 1870. He is a member of the New York bar and is active in civic affairs. In 1897 he was nominated for judge of the City Court on the Citizens' Union ticket as well as on the People's ticket. In 1896 he founded the Hall of Records Association, to properly house the public records in New York city. Born in Westphalia, Prussia, 1787; died in Cincinnati, Ohio, 1853. He was sent to New York in 1821 as supercargo in a sailing vessel belonging to his uncle, a banker and ship-owner of Amsterdam. In 1819 he settled in Cincinnati, Ohio, and founded in that city about 1825 the first wholesale dry-goods house, that of Menken & Milius. His sons, Jules A. (born in New York 1836; died at Watch Point, Vt., 1890; first lieutenant in the Home Guards, Cincinnati, during the Rebellion), Nathan Davis, and Jacob Stanwood Menken (for the last two see above), were merchants in Cincinnati (from 1855 to 1861) and Jules A. and Nathan Davis in Memphis, Tenn. (as Menken & Co. from 1862 to 1888, and as J. S. Menken & Co. from 1888 to 1899). Simon Wolf, The American Jew as Patriot, Soldier, and Citizen, Philadelphia, 1895.